THREE NEW ONE WOMAN SHOWS each night for only $15 TOTAL!!!! Also in these three evenings wonderful Tantra Zawadi presents, "Soldier Blues" An exploration through word, music, and movement of the battlefield of the soul and heart. Soldier Blues is an interpretation through poem/movement, that examines the hearts and circumstances of Americans who enlist in the armed forces. The accompanying original sound track explores the "blues" which also has deep roots in American history. The music progresses as does the poem/video presentation; from the opening poem by Blis Blis, the mother who is praying for the safe return of her soldier girl, the lover-man longing for his woman back in the states, to the married mother who left her family behind. Soldier Blues, written and performed by Tantra-zawadi, was inspired by poet/musician Xavier Kemp and is a call for America to help our soldiers recover when they return home. Music created by Stevie Gee, Leviticus, Russ Mitkowski and BooBoo Cousins. Art work by Shanna Melton. Video edited by Oliver Covrett, XYAYX Multimedia with choreography by Von Jacobs. Tantra-zawadi, an award winning international poet, recording artist and filmmaker, is a native of Brooklyn, New York. She has performed in South Africa, London and Germany and her new documentary, "A Silent Genocide A Brief Insight Into HIV/AIDS" offers a glimpse into the lives of those living with HIV along with commentary by Betty Makoni, a 2009 Top Ten CNN Hero and founder of Girl Child Network Worldwide. For learn more about Ms. Zawadi or to view her documentary, please visit her on-line at www.tantra-zawadi.com. Also introducing a new performance by Sokhna Heathyre Mabin!!! called snapshots from the underground forrest - 1 line description: snapshots from the underground forrest is a choreocollage of how this sister deals with betrayal, abandonment, revelation, joy, birth, healing & maintanance to a higher level of being. Performance description: snapshots from the underground forrest, is a choreocollage of music, dance, vocal soundings, poetry, & her reality - be it real or semi-fictitious. Working her way thru luv, betrayal, be(lie)fs, by way of the daily commitments, sokhna intuits how 2 alchemically transform the mundane 2 the sacred. sokhna heathyre mabin is a multi-artistic performance artist who uses her life experience, dance, music & trust to express her revelations...sokhna is the mother of 2 other multitalented, passionate artists, a doula, & yoga instructor. NOTE: PARTIAL PROCEEDS OF BELOW EVENT TO BENEFIT PEOPLE OF HAITI!!!! 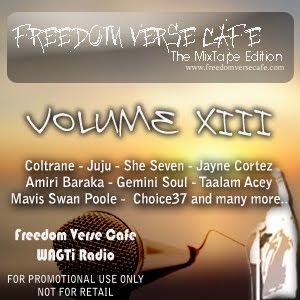 Freedom Verse Café the Mixtape Edition is all about creating the experience of positive vibes that touch you mentally and spiritually while invigorating the soul with good entertainment while promoting good arts. Freedom Verse Café primarily focuses on promoting spoken word as a recognized genre while blending it with beautiful melodics of soul and jazz to make the ultimate blend in listening pleasure. This blend is dynamically designed to educate the listener on poets and artist whom they may have never heard, as well as bringing on new listeners for the artists, so remember to support the artist as you listen in to the soulful harmonics of a beautiful art called spoken word poetry. Take a sip! 20. The Soul of Men - Floyd Boykins Jr.
**As always, support these artist and the genres by looking them up and purchasing their work, and while you're doing that take the time to learn a little bit about them and why they do what it is that they do...giving thanks and much love to you all, peace! 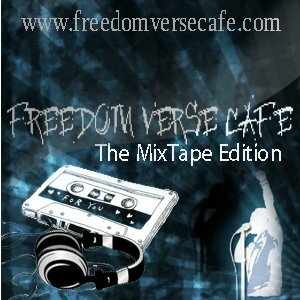 Freedom Verse Café (FVC) was created as a venue for spoken word artist in the winter of 2008 from a previous venue called "Mic Check" which began its broadcast in June of 2007. Since this venue's inception, it has gone through evolutionary processes to better accomplish its premise of promoting the art of spoken-word poetry and the artists who perform it in a major capacity, but we have also expanded to blending poetry with jazz and soul to create the ultimate experience of spoken word/poetry. Freedom Verse is geared to promote the artists—who hit the stages, spoken-word venues, and publish their works anywhere that they can—while entertaining and educating listeners all over the world. In FVC we focus on imparting those who audience the genre of spoken-word poetry to its history, disciplines, and its potential impact on mainstream culture. This venue hopes to touch its patrons mentally and spiritually. In this we learn to appreciate the creativity, relevancy, and intentions of the artists. FVC promotes using online broadcasting and digital downloads of mix-tapes that focuses on providing a positive form of entertainment and educational programming in poetry, jazz, and soul of artist who are destined to change the world. Please call (206)338-1187 and leave a message and we'll get it on the air for FREE! ~Live Chat and Call-in Line!~reaching more than 490,000 listeners globally, with listeners from S. Africa to Vladivostok, Russia and all across the United States to Europe. Are a compilation of Spoken word poetry, jazz, and soul blended for the ultimate listening experience. These mixtapes are free to download and are designed to promote the artists who make it possible to provide positive music in a less positive industry. So please support the featured artists by purchasing their work and stopping by their pages and showing some love. Spoken Word poetry is a very newly revived form of poetry that has been around since the 90’s. Spoken word is a transformation from an art that began deep in the heart of what was known as the beat poet era of the ‘40s and ‘60s. These were poets who challenged mainstream politics and culture to incite mental revolutions against what I would dub as “idle conformity or assimilation” by government rule; speaking out against oppression, racism, and war. In most cases this was the only form of thought expression albeit a dangerous one regardless of the first amendment that is designed to protect all of our citizens. Spoken word as a genre has always been seen as non-musical selections like famous speeches and orations, but never as a poetic art deserving of it's on section. Even today this still is the case when you walk into a record shop or shop on iTunes you won’t find a legitimate genre for this beautiful and ageless art form. Poets today are working diligently and hard to change this mindset. Today, Spoken Word poetry is a very general category of poetry that is meant to be both performed and to make a powerful statement. Unlike some of the Beat poets who focused mostly on the corruption of government, economic and social status, and world awareness, Spoken Word has taken a major turn which some like myself observe with a watchful eye. Spoken word has gone from just being a revolting art, but has become more interested in voicing the thoughts of love, life and still that resounding need for revolutionary thought. All Spoken Word poetry is meant to be read aloud, but not all poetry that is read aloud is Spoken Word. Spoken word has a select few elements that are best known for identifying its class of poetry. I like to call this technique “R3” for Rhythm, Repetition, and Rhyme; these are key element that the artist generally focuses on when performing this style of poetry also called performance poetry. This is an important part about spoken word poetry, as I often see this as a common mistake amongst new poets who don’t study the art or its history and are elated to lay their vocals down on a nice melodic track and will dub it “Spoken Word”; spoken word poetry is sometimes performed with music, and sometimes without music. If a poet uses background music, it is only to enhance or compliment the poetry and to add a rhythm. The poetry itself is center stage and not the music, this is the case in any good piece of work. This blog copyright © 2009 Freedom Verse Cafe. All Rights Reserved.